CHICAGO -- Weapons charges have been filed against a man who was shot by a Chicago Police officer after an "armed confrontation" Saturday night in the Southwest Side Gage Park neighborhood. 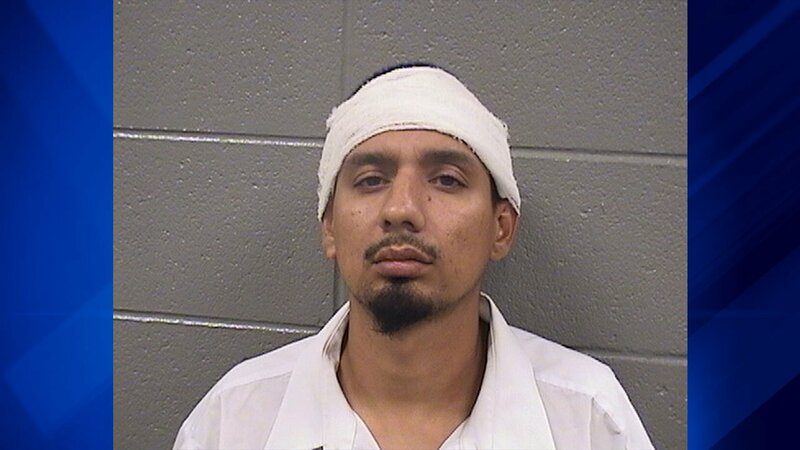 Erick Carrazco, 32, of Cicero was charged with one felony count each of unlawful possession or use of a firearm by a felon and aggravated assault of a peace officer with a firearm, according to Chicago Police. Judge Adam Bourgeois Jr. ordered Carrazco held on a $750,000 bond during a hearing Tuesday, court records show. He is also being held without bond on a violation of probation for an aggravated DUI/license suspended or revoked case, according to the Cook County sheriff's office. About 8:45 p.m. Saturday, officers approached a group of males who were drinking in the 5600 block of South Artesian, police said. When the officers walked up to the group, they noticed one of them had a handgun. An "armed confrontation ensued" and one of the officers discharged his weapon, police said. Carrazco suffered a graze wound to the neck and was taken to a hospital with injuries that were not thought to be life-threatening. No officers were injured and a weapon was recovered at the scene, police said. The officer involved in the shooting will be placed on routine administrative duties for 30 days, police said. The Independent Police Review Authority was investigating the use of force. Carrazco's next court date was scheduled for Aug. 25, according to court records.